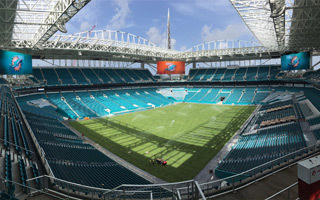 Last Friday the very final element of New Miami Stadium’s (temporary name, pending naming rights deal) new roof was installed, marking the end of a monumentally impressive project. In just over half a year 14,000 tons of steel were lifted above the field, creating one of North America’s most impressive roofs. Total surface of 58,000 m2 (of which 8,800 m2 is translucent ETFE) makes this roof one of the largest of its kind, comparable with Stade de France in Paris both in terms of weight and size. Even more impressively, the roof – due to location in Florida – was designed to withstand hurricane winds of up to 250 km/h (Category IV hurricane), while also supporting four huge screens in each corner, every one of 520 m2. The roof structure was lifted by crawler cranes moving around the field. Once they left late last week, leveling of the surface began in order to lay new turf. First rolls of grass arrived on Monday and by evening yesterday the whole field was in place. New Miami Stadium received a new kind of grass, created just 9 years ago. Paspalum vaginatum is widely used on golf courts due to its durability and ability to grow with limited sunlight access, both very important advantages at a shaded stadium used by two American football teams (Dolphins of the NFL and Hurricanes of the NCAA). The grass arrived from Alabama in 27 trucks. Despite some fears of not meeting the tight deadline, it seems both openings for Dolphins and the Hurricanes (on Sept 1 and 3, respectively) will take place as planned. Complete reconstruction of the aging Sun Life Stadium, as it was known until last year, began in January 2015. With only 18 months for delivery, the lower stands were reconstructed, all corporate hospitality zones revamped, seats replaced and finally last week the landmark roof was also delivered. Though financed privately, the reconstruction was granted tax aid. It proved much more expensive than initially expected. Instead of $350-400 million, the budget is now expected to close with expenditure of some $550 million.